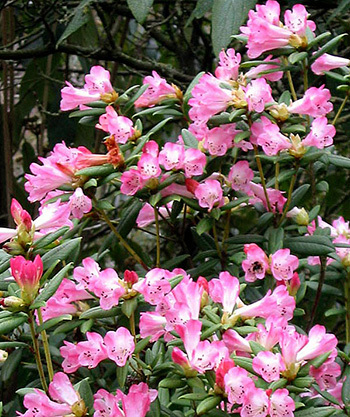 I'm going to include this pretty pink Azalea shrub in with the rhododendrons - I've always called it an Azalea. It flowers in early spring, and I can see it from the house windows - as long as the nearby Choisya shrubs don't get too pushy! The large pink Azalea was already planted in the Island Bed when I came to Mooseys all those years ago. So I have no way of knowing what variety it is. It's fairly tall and bushy, and has weathered a few mild winter snow storms without too many branches breaking. Lucky! The flowers are such a pretty combination of cool pink and white. And for some weeks in spring the shrub is absolutely covered with blooms. It's difficult to miss. Ha! 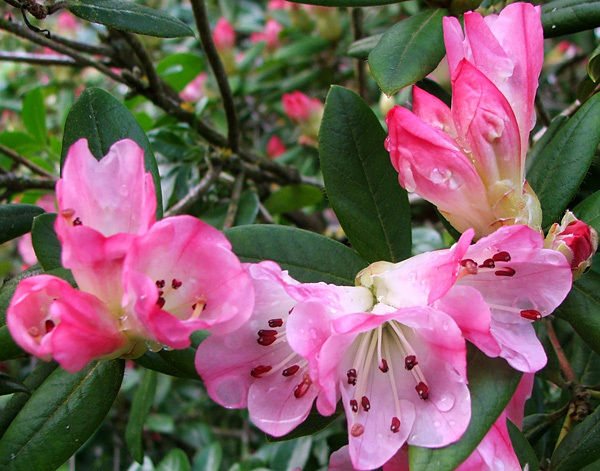 To quote from my big book of shrubs and trees, Azaleas were originally classified as a separate genus but are now regarded as botanically part of the Rhododendron genus. So it's perfectly at home in my rhododendrons section. Phew!